It made no sense for Bruce and me to get a puppy. After all, I’m traveling back and forth to Washington nearly every week, and Bruce has a full-time job. We have no kids at home to help out. And a puppy is a bother – chewing everything, piddling on the floor, crying in the middle of the night. You know what the don’t-do-this list looks like. 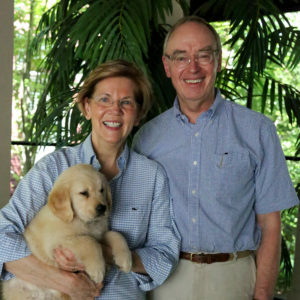 But Otis, our big, solid golden retriever had gotten me through my first Senate campaign. When all the decisions and demands crowded in, Bruce and I would walk Otis around Fresh Pond. If I really felt aggravated by some Republican attack, I’d brush Otis. And every evening, Bruce, Otis and I would settle on the couch for an hour of television. Otis died of cancer just five days before the 2012 election. And once he was gone, I couldn’t do it again. From time to time, Bruce and I would talk about it, but a new puppy made no sense. The fights in Washington have gotten more intense. The stakes have gotten higher. The losses have mounted up. A few weeks ago, Bruce said, “We’re getting a dog.” I started to recite the list, and Bruce just smiled. “The heart wants what the heart wants.” And now we have Bailey who chews, piddles, and makes my heart happy. Today is our anniversary, and I’m reminded of one more reason I love Bruce: He knows about the things my heart wants. Happy anniversary. I love you, sweetie.